Came [Dm]into fortune and bought him[G7]self a goat. Said [C]he "sure o' goat's milk, I mean to have my[A7] fill"
But [Dm]when he got his nanny home, [C]he [G7]found it was a [C]bill. They're [G]all wearin' bustles like their mothers used to do. And they [Dm]leave the rest to [G7]providence [C]and Paddy [F]McGinty's [C]goat. She washed out her trousseau and hung it out to dry. The goat came along and he saw the bits of white. He chewed up all her falderals & on her weddin' night. "Although I'm your bride, I'm not worth lookin' at. 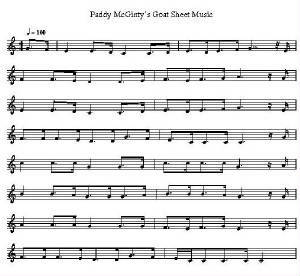 Now I've one of nothing all for Paddy McGinty's Goat." He won 20 dollars and shouted, "Hip-hooray." He held up the note, and said, "Look what I've got,"
The goat came up and grabbed it and swallered all the lot. "He swallowed up me bank notes," said Mickey with a hump. They ran for the doctor and he brought his stomach pump. But he wound up with no money all for Paddy McGinty's goat. Mrs. Berg said to her daughter, "Listen, Mary Jane. Who was the old man you were neckin' in the lane? He had long wiry whiskers all hangin' from his chin." "'Twas only Paddy McGinty's goat," she answered with a grin. Rings on 'er fingers and wearin' a sable coat. At the risk of sounding Irish, I can honestly say that my unexpected success as a recording artist really found its beginnings on television. To fully explain that, I'll need to take you back a few years, in fact, to the late fifties. My main claim to fame at that time was a weekly thirty-minute radio show on what was then known as the BBC Light Programme. Each Tuesday morning at ten o'clock, presented my own half hour of music and light-hearted banter. Instead of playing recorded music however, we had a small studio orchestra. I sang folk-songs with my own guitar, songs with the orchestra, read amusing letters from listeners and tried when possible to cater for special requests. It was all great fun and happily, popular enough to run over several years. The whole process enabled me to build a formidable and varied repertoire and thankfully a sizeable listening audience. As a result I was offered personal appearances as a cabaret guest at various functions, concerts etc... As months went by, people kept asking me, 'Why can't we get any records of you wing these unusual little songs?' With the prospect of a recording deal in mind, I put together some tapes of the radio shows, my only form of audition material, and planned a sales trip around the various record companies, EMI, HMV, Decca and others. Sadly, the exercise was fruitless, they showed no interest whatever. Soon we were in the sixties. My radio show was gaining in popularity, my personal appearance money had increased, and the one-night stands to a large extent, were replaced by weekly engagements at clubs up and down the country. As a bonus, my radio producer invited me to write some of the orchestral backing to my songs with the studio orchestra, a labour of love which was to bring me some six times the fee I was getting for the show. (For devising, writing and presenting the show, together with about five vocal contributions a week, I was paid eight guineas, that's about eight pounds, eight shillings — Chris Evans, eat your heart out!) As far as I was concerned, I was doing very nicely. This was after all, back in the early sixties and believe me, that was the sort money paid by The B.B.C. Then in early 1964 came a sequence of events which prompted my then manager Eve Taylor to sit back in her office chair, shuke her head and say, 'Well if Hollywood was to make a movie of this nobody would believe a word of it. Val Doonican The Paddy McGinty's Goat Singer.